April is doing a broadcast about an ancient temple of unknown culture that was uncovered by archeologists. Wandering around, Baxter encounters the temple and frightens the archeologists away. He decides to investigate the temple and discovers that it is a spaceship that crashed there 300 years ago. This spaceship is equipped with a dimensional warp drive that allows one to go back and forth between dimensions without a portal. Baxter decides to set a trap for Krang and Shredder using the warp drive. The Turtles hear April’s broadcast and are concerned that the so-called temple is near their lair and set out to investigate the site. On their way they run into Shredder. Meanwhile, Baxter discovers a muto-ray gun on the spaceship that can transform whatever it strikes into another life form. Using the gun, Baxter transforms Shredder into a fly and Michaelangelo into a Teenage Mutant Ninja Gerbil. 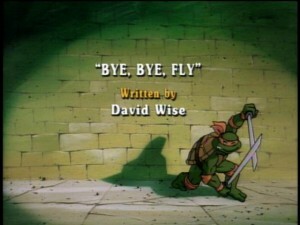 The other Turtles manage to transform Michaelangelo back to himself, but Baxter steals the spaceship and escapes. The episode ends with Shredder, Bebop and Rocksteady returning to the Technodrome even though Shredder has not been transformed back to a human.